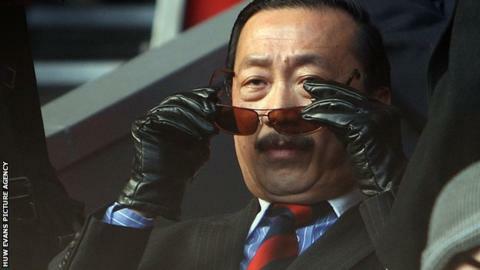 Cardiff City owner Vincent Tan says he is planning to take legal action against a number of football agents over fees they received for players bought by former manager Malky Mackay. Mackay, who was sacked in December, denies overspending millions of pounds on players during his time at the club. In an interview with Reuters, Malaysian billionaire Tan said "several agents" would be taken to court. "There'll be some court case coming up over this," Tan said. "I happened to have a manager [Mackay] who I think overspent. "I think he... overpaid a lot of players, paid the agents too much agent fees." BBC Sport contacted the club's former head of recruitment, Iain Moody, and Mackay's agent but they were not immediately available to comment.